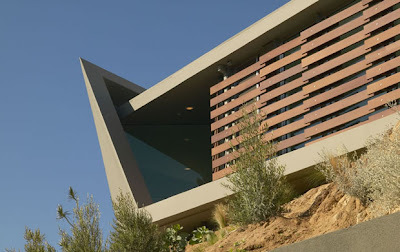 A environmental friendly sensitive Skyline Residence, designed by Belzberg Architects, located in the Hollywood Hills under a limited budget with the use of local manufactured materials and sustainable techniques. The project consists of a main house combined with a guest house. 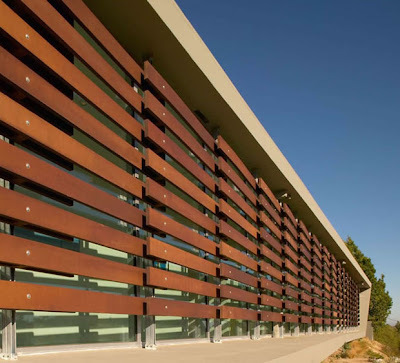 Both buildings are enclosed by a single folded surface with infill glazing and screened walls. Each room has at least one fully glazed wall. 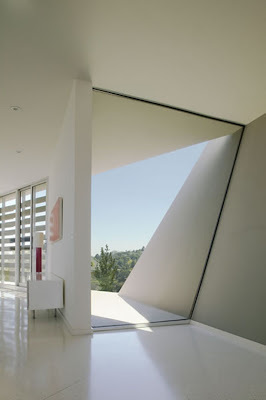 The fold itself represents the only solid exterior surfaces defining the form of the building. The guest house is separate from the main house. The Southern face of the guest house is used for movie projections.